Solutions Research Group Consultants Inc.
Scandal’s Olivia Pope had better watch her back, because House of Cards’ Frank Underwood is coming for her. Must-see TV is giving way to “much-stream TV,” with Americans increasingly likely to name streaming services such as Netflix, Hulu and Amazon Prime Video among their most valued entertainment options. These services reshaped Solutions Research Group’s 10th annual Must Keep TV Report, which interviews American consumers about which TV channels and services they regard as a must-have in their households. Netflix ranks fourth overall in its first appearance in the study. It finished behind ABC, CBS and NBC but ahead of FOX. This is the first time in the study’s 10-year history that the Big Four networks failed to occupy the top four spots, with Netflix’s emergence pushing FOX into fifth place. Rounding out the top 10 are ESPN, HBO, Discovery, PBS and CW. History came in at #11 this year, followed by AMC at #12, unchanged from last year. HGTV is the momentum brand of the year, coming in at #13, up six spots from #19 in 2016. The three largest streaming brands – Netflix, Amazon Prime Video and Hulu – were included in our tracking for the first time in 2017. They performed extremely well as a group, all landing in the top 25 for the full 12+ population, coming in at #4 (Netflix), #14 (Amazon Prime Video) and #22 (Hulu). The top two news cable channels appear stronger than ever in terms of viewer engagement. CNN came in at #15 overall, neck-and-neck with FOX News at #16. The two rivals have been this close together only once in the study’s 10-year history, in 2008 – when CNN was ranked #14 overall and FOX News came in at #18. CNN is the clear choice among Americans under 50, coming in as the #15 ‘must keep’ TV brand among 18-49, far ahead of FOX News at #28. Among affluent households – those with income of over $100,000 – FOX News is seen as slightly more important, ranking #8, compared to CNN at #12. Sports cable channels continue to perform well among men 18-49: ESPN is #5 overall, and the #1 cable channel in this demographic for the 10th straight year. Fox Sports 1 and ESPN 2 are ranked #20 and #25 respectively, similar to their previous positions. Fox Sports 2 dipped slightly in the past year, while NBC Sports is up slightly. More U.S. households now have a streaming service than a DVR, which means that digital-era services will continue to grow in importance, particularly among younger Americans. The three streaming brands included in the study all ranked highly among 18-34s, with Netflix and Hulu in the Top 10: Netflix claimed the top spot while Hulu came in at #9. Amazon Prime Video was a hair outside the Top 10, coming in at #11. 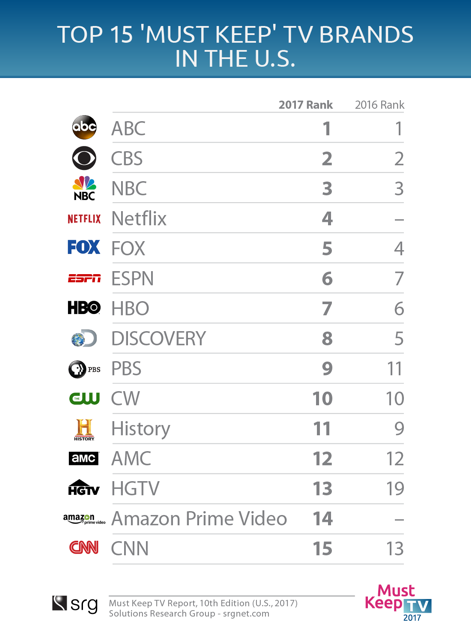 Network and general cable brands with momentum in the younger demographic this year include: NBC, CW, FX, HGTV, History and Travel. With ABC, CBS, and NBC ranking #1, #2, and #3 respectively, Netflix elbows its way in at #4, with FOX rounding out the top 5 ranking for Women 25-54. Amazon Prime Video debuts at #8 for this demographic, putting two streaming services in the top 10 and speaking to the importance of being able to access entertainment on their own schedule. Movers gaining top 10 status this year include CW at #7 (its first time in the top 10), HGTV (#9, its second time in the top 10 in the past 10 years) and ESPN. Hallmark Channel broke into the top 20 for the first time since tracking began in 2007, and is now ranked #19 among Women 25-54, its best showing since 2007. In 2017, 72% of those interviewed included at least one of the big four networks (one or more of ABC, CBS, NBC, FOX) on their ‘must keep’ channel list. While that is still a strong majority, it represents an 11-point drop from the historic high of 83% in 2007. Networks’ brand equity eroded more among younger Americans – with only 62% including one of the big four in their top ‘must keep’ list in 2017, down 19 points from 81% a decade ago. As smartphones, tablets and other connected screens proliferate, fewer U.S. households have a TV in every room. In 2017, 51% of households reported owning three or more TV sets, down from 56% in 2013 and a high of 65% in 2007. 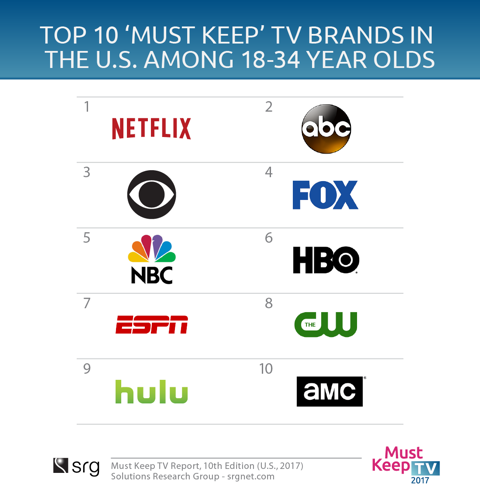 Technical: ‘Must Keep’ TV is an independent syndicated brand tracking survey conducted by Solutions Research Group (SRG) among a representative sample of American consumers. This is the 10th edition of the survey since 2007. The questions have been fielded and presented in the same manner each year. The 2017 research is based on online interviews with 1,425 American consumers aged 12 and older and conducted in April 2017 – the sample captures and represents all major population segments. Respondents are shown a list of 77 broadcast, cable and high-penetration streaming brands and are asked to identify which ones would be on their ‘must keep TV’ list if they had to choose a limited number. Sample design is balanced by geography, gender and ethnicity, including African- American and English-speaking Hispanics according to known universe parameters.